Orange was the color of the day at the Beijing Olympic Tennis Center September 14, 2008. Egged on by loud cheers from the packed stadium, unbeatable Dutch defending champion Esther Vergeer notched up an unprecedented third Paralympic title in wheelchair tennis women's singles after a three-set thriller against compatriot Korie Homan. En route to the final, Vergeer beat all her rivals in straight sets. Going into the final, Vergeer had a clean win record in 34 encounters with world No 2 Homan, who made her wheelchair tennis debut only in 2003 and was appearing in her maiden Paralympics. But it was a hard-won victory for the defending champion. In a nail-biting encounter that lasted two hours, Vergeer took the first set 6-2 with ease, but, as she later admitted, got nervous in the second set and lost 4-6. In the deciding third set, Homan played more aggressively to extend the match to a tie-breaker. In the end, Vergeer's composure and her opponent's relative lack of big-match experience proved decisive as she wrapped up the game 7-6(5). "It was a very hard game. Homan did amazingly today. I was getting nervous and scared after the second set," Vergeer said after the final. "I was just this close to losing the match today, the most important match of my whole year. I am just the happiest person in the world right now." She said she believed her fighting spirit helped her prevail. "I am a fighter and it was proved today. Maybe it's not the most beautiful match but I just wanted to win." she told The Paralympian. The disappointed silver medalist now seems more confident of dethroning the seemingly-invincible Vergeer in the future. "In a while, I will be proud of my performance today. Now I know how close I came to beating Vergeer, and one day I will beat her." Earlier, Florence Gravellier of France took the bronze. Today, Vergeer will pair up with Jiske Griffioen in the women's doubles final and said she is looking forward to her sixth gold medal at the Paralympics. The world No 1 extended her winning streak to 350 international singles matches since her last loss in January 2003. The 27-year-old has led the singles year-ending rankings for eight consecutive years. The superstar in the wheelchair became a paraplegic during a surgical accident at age 12. 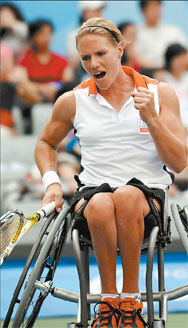 She took up wheelchair tennis as part of rehabilitation. One year later, in 1994, she started professional training and soon made a name on the court. Her brilliant winning streak and attractive personality have drawn dozen sponsors, including big names such as adidas, Mercedes-Benz and Head. She also set up a charity foundation in the Netherlands, called "Handzzzup Foundation" to help children with a disability get involved with sports. Also yesterday, British veteran Peter Norfolk defended his quad singles title by blanking fourth-seed Johan Andersson of Sweden in straight sets 6-2, 6-2.